For nearly 20 years, Kentucky Farm Bureau has provided educators with a variety of teacher training and professional development opportunities designed to better enable participants to incorporate agriculture into their daily core curriculum. The hard work that teachers put into classroom preparation and improving their instructional techniques continues through the summer. 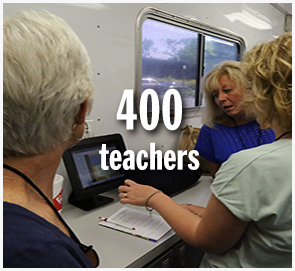 Each year, Kentucky Farm Bureau hosts nearly 400 teachers from across the state to attend one of its five free professional development workshops. The day-long workshops are designed to address Kentucky’s core educational competencies while showcasing a variety of state and national agricultural curricula. Workshops emphasize the value of incorporating gardening into all areas of curriculum. These thematic lessons and materials incorporate mathematics, social studies, English and science through real-life application in indoor and outdoor training sessions. Chartered tours of local agricultural operations further highlight the practical environmental and agricultural information so that it can easily be translated into a classroom setting.